Osprey Daylite vs Daylite Plus - Read this before you buy one! 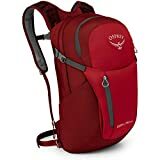 You are here:Home-Backpacks, Reviews-Osprey Daylite vs Daylite Plus – What’s The Difference? If you're trying to decide between the Osprey Daylite and the Daylite Plus, I'll make it easy. The Daylite Plus has an external pouch with a quick access zipper. The Daylite Plus only weighs 4 ounces more than the Daylite. The only trade-off you have to make is a slightly higher weight but it's more than made up for with the extra volume and pouches you get. Here's a handy chart showing a side by side comparison of the Daylite and Daylite Plus. For me, the decision between these two backpacks isn't even close. The Daylite Plus comes with almost double the capacity of the standard Daylite backpack. It also has an additional zipper pouch and stash pocket which makes it way easier to get to your gear. The only downside to the Plus version is that it weighs 4 ounces more than the standard Daylite. Four ounces is barely noticeable and since it's a daypack, you probably won't be carrying that much stuff in it which makes the weight difference even less important. I've already covered the differences between these packs so it's worth reviewing what they have in common. They have the same strap locations - Shoulder straps, a hip belt and a chest/sternum strap. Mesh material to wick away moisture. The price gap between the two backpacks is pretty small and since these packs last for a long time, it's a good idea to go with the higher end Daylite Plus.